The Israeli and French navies teamed up to conduct the first joint drills between the two countries in 55 years . INS Eilat Sa’ar and INS Kidon Sa’ar docked in the port of Toulon on 21 June. The drills involved simulated missile launches at the ships from low-flying fighter jets, as well as a multi-casualty evacuation and rescue exercise. CNBC reports that China has been quietly testing electronic warfare assets  in the South China Sea. Recent intelligence assessments suggest that this is the first time the equipment has been used since it was deployed to Chinese military outposts  in the Spratly Islands earlier this year. The systems are designed to confuse and jam communications, which would give China increased power projection in the South China Sea. It was a big weekend for the Royal Australian Navy. On Friday, Vice Admiral Tim Barrett formally ended his time as Chief of Navy, handing over command  to Vice Admiral Michael Noonan in a ceremony in Canberra. On Sunday, more than a thousand people, including the new Chief of Navy, were on hand to welcome HMAS Warramunga home  from the Middle East. During its nine-month deployment, the Warramunga significantly disrupted terrorist and criminal organisations, seizing 31.8 tonnes of hashish and two tonnes of heroin valued at approximately A$2.17 billion. According to an exclusive  report from Reuters, defence contractor Northrop Grumman is angling to compete with Lockheed Martin for the contract for Japan’s next-generation F-3 stealth fighter. The contract will be fiercely contested. Lockheed Martin worked with Japan  on an earlier, fourth-generation fighter and already has a hybrid concept  with features from the fifth-generation F-22 and F-35. Germany halted deliveries  of the Eurofighter Typhoon combat aircraft after discovering a technical defect. It’s the latest in a series of problems  which have included technical issues, high staff turnover, and lack of missiles. In May, Der Spiegel reported that only four of Germany’s 128 Eurofighters —the backbone of the German air force—were ready for combat. The problems in Germany’s air force aren’t isolated to the Eurofighter, raising doubts  about the reliability of this European partner for the Western security alliance. South Korea’s ambassador to Nigeria said that South Korea intended to collaborate  with the Nigerian Air Force to fight insurgencies in northeast Africa. South Korea would enhance the NAF’s operational capability  by providing intelligence, surveillance and reconnaissance support, as well as technical expertise. The Turkish government has dismissed almost 19,000 people from its civil service —including more than 6,000 members of its armed forces and around 9,000 members of its security services—because of alleged links to terror groups . The dismissals, as well as widespread passport cancellations, were made under a statutory decree. The news came as Recep Tayyip Erdogan was sworn in  as Turkey’s first executive president, with increased powers. Parliament has promised to lift the state of emergency  that’s been in place since the July 2016 attempted coup. The Pentagon has come under scrutiny  for lack of transparency  on troop numbers in Iraq, Syria and Afghanistan. For more than a decade, troop deployments were listed on a public Pentagon website that was updated every three months; however, the numbers were scrubbed  earlier this year. While troop numbers aren’t necessarily indicative of military activity, national security experts Loren DeJonge Schulman and Alice Friend claim that troop levels are a ‘litmus test’  for the public to comprehend the scope and scale of their government’s commitment to a particular conflict. 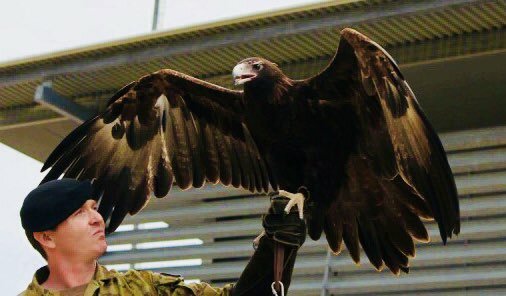 The ADF has welcomed Recruit Courage , a 12-year-old wedge-tailed eagle, as the mascot for the 2nd Cavalry Regiment. The mascot is selected to represent the qualities of the regiment. Recruit Courage’s long-range vision and her skills in swiftly attacking prey reflect the cavalry’s role as the ‘eyes and ears’ of the battlefield. She will deploy as a qualified Royal Australian Armoured Corps soldier  in late July. This week is all about satellites. This article from Tech Crunch  shows the top seven private satellite technology companies, ranked by total funding. Five are located in the US, one in South Korea and one in Singapore. There’s a significant concentration of funding in broadband internet companies, such as OneWeb , which has accumulated US$1.7 billion in funding. OneWeb aims to provide global internet broadband by 2027, through the creation of a constellation of 900 satellites. But OneWeb may soon have some competition. It’s been reported that China and Russia have discussed the possibility of creating a joint satellite communications system . The proposed system will consist of 1,000 satellites in low, medium and geostationary orbit. In addition, China’s National Space Administration and Russia’s state space corporation Roscomos have agreed to further their cooperation  in testing the accuracy of earth observation data from Russian and Chinese satellites. So what does this all mean for the future of the space domain? As one article mentions, satellites are critical for many aspects of national security , so it’s no surprise that many countries are developing satellite capabilities. As another article points out, the space industry can be seen as an ‘emerging business sector’ that can contribute to economic growth. Yet the article also raises the issue of cyber threats that come with developing new technologies. Countries like South Korea  with a single satellite provider are seeing the commercial benefit of the space industry, and are aiming to expand services globally. Last week Moscow hosted the International Cybersecurity Conference and President Vladimir Putin gave the opening speech . He said Russia’s digital economy program aimed to modernise information infrastructure, particularly for medicine and education. Putin then went on to talk about the importance of tackling cybercrime and promoting greater international cooperation to ‘develop common rules of the game and binding international standards that will take into account the rights and interests of all countries as much as possible and will be universal and acceptable for all’. Vietnam’s recently passed cybersecurity law has been criticised for undermining free speech . The law, drafted by the country’s Ministry of Public Security and passed last month , requires tech companies to hand over data to Vietnamese authorities on request and to censor any contentious content. However, civil society has proven resilient: Vietnamese citizens have responded with rare public displays of dissent  and thousands have abandoned mainstream social media platforms  such as Facebook in favour of open-source alternatives. A popular fitness app that tracks the activity data of users has once again inadvertently revealed the locations and identities  of personnel working at military bases and intelligence services. The app, Polar Flow, is reported to have revealed the identities  of personnel working for the FBI and NSA, Russian soldiers in Crimea, and Americans in the Green Zone in Baghdad. This is the second time this year that a fitness app has compromised national security. In January, ASPI’s own Nathan Ruser  discovered that the fitness app Strava revealed the locations of several secret military bases. Christopher Dixon, Jessica Clarence, Amelia Meurant-Tompkinson and Melissa Liberatore are research interns at ASPI. Image courtesy of Twitter user 2nd Cavalry Regiment.